Convive Wine & Spirits has opened for business at 196 Avenue A between 12th Street and 13th Street. The store's Instagram account notes this: "National wine & spirits retailer located in East Village of New York. We pride ourselves on our customer service, our selection and our many opinions." The shop is open Monday-Saturday from 11 a.m. to 10 p.m.; noon to 8 p.m. Sunday. Avenue A Wine & Liquor was the previous tenant here. Very impressive and very going out of business soon. There are some delightful $250 bottles of wine in the back area sure to impress the soon to residents of the new mega-condo building across the street. I was in recently- the staff was very friendly, very helpful and the had many reasonably priced bottles of wine. Nice edition to the neighborhood despite what the whiners and trolls put out. I'm sure they staff is very friendly and very helpful and that still has no bearing whatsoever on whether this place will be around tomorrow. 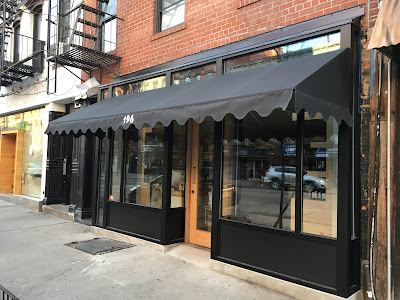 If something merely being a "nice edition to the neighborhood" was sufficient to keep its doors open then [fill in the blank] would still be here. Look, we wish them all success but note that the previous tenant was ... wait for it ... a wine and liquor store. Moooom, Reality is trolling me again! Make it stop! I'll go in and find something I can afford, I'm pretty loyal to Bee Liquors though. Wow what a bunch of trolls in this comment section. But unlike other places on the internet the likelyhood that you are actually old, wart-covered, and smelly is high. Good luck to you Convive! $10-$15 bottles are located in front of store. They carry hard liquor also. Beautiful store and staff seemed friendly enough. An option if I don't feel like walking to Bee Liquors. This beautifully designed store seems like exactly the kind of place that will appeal to incoming millionaires—what, do we think rich people don't drink? And in the meantime they do have moderately priced bottles for the rest of the neighborhood. I was in there this weekend and the staff is very nice and they seem like total professionals. This clearly isn't Empire Biscuits 2.0, so I say we give these people a chance. That said, Convive needs to restrain their comment-sections supporters who think they are doing the business any favors by calling local doubters "old, war-covered, and smelly." It's a trashy sentiment that is obviously coming from overreactive friends/family. Call off the dogs. Just some friendly advice. Honest question in all seriousness. Why would anyone drink a 10-15$ bottle of wine? People should work on being a little more awesome and treat them selves once and a while. I have never seen such petty and pathetic resentment. Who do you think is bitching? I'll tell you...people who would never frequent the store anyway. I assure you these very same people (ironically) profess political tolerance and diversity UNLESS its someone they don't like. Well I say welcome to Convive and good luck. I welcome you in the name of inclusion and appreciate any small business owner willing to take the risk, create a greater tax base, hire employees, and improve the viability of this neighborhood. I'll frequent you!